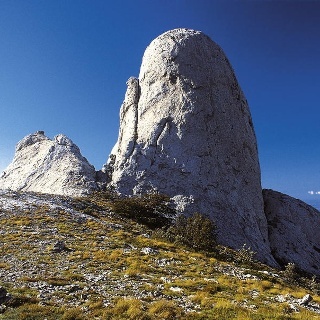 The area of Paklenica is one of the most interesting karst areas of Velebit and Croatia. At the base of the series of the highest peaks of Velebit, torrents have created two deep canyons representing a combination of longitudinal and deeply cut valleys in geomorphological terms. The most interesting sections are deeply cut areas of Velika Paklenica and Mala Paklenica, where creeks have created their beds penetrating through the rocks, some over 300 meters high. The longitudinal section 6 to 7 kilometers long, from Ivine vodice to the source of the creek of Brezimenjača, is located right below the highest peaks of Velebit that rise steeply from the valley for up to 1000 meters, creating series of sharp rocks in high elevations. On the side of the region of Lika, the mountain ridge also steeply rises along the line of the Velebit fault, with the field of Ličko polje spreading along it in the hinterland. 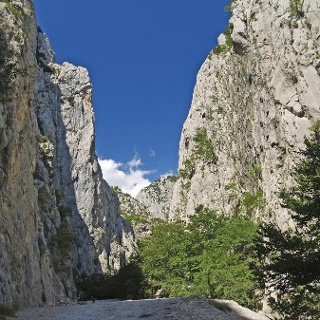 Thanks to its extraordinary natural values, Paklenica has been declared a national park. 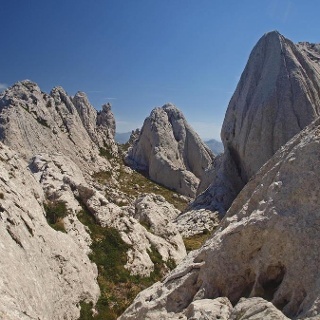 Paklenica is very popular among rock climbers, well known throughout Europe as one of the most beautiful European rock climbing sites, due to its pleasant climate, beautiful nature and diverse climbing opportunities. The White Line of Via Dinarica follows the route of the Velebit Hiking Trail along the peak area of Velebit, via Vaganski vrh to Sveto brdo. From the Struge mountain shelter, we continue along the trail for 10 minutes until we reach the well of Marasovac. From there, we turn right to a marked trail leading uphill through rocky terrain and sparse thicket. The climb soon becomes steeper, remaining such to the mountain pass below Babin vrh. Going further, a well-trodden path leads through rocky area, around several deep karst depressions, and then to the ridge, where we finally get to Vaganski vrh. There is a longitudinal trail there, leading along the ridge and connecting all peaks, that serves as starting point for the final climb. The section from Struge to Vaganski vrh takes approximately 2 hours, and there are approximately 4 hours of hiking from Vaganski vrh to Sveto brdo, so the passage along the entire ridge between Struge and Sveto brdo represents a demanding full-day excursion. The path is poorly marked (with rare markings); however, orientation does not pose a difficulty in good weather conditions. Proceeding to the southeast from Vaganski vrh, the trail steeply descends for 10 minutes of hiking to a flatter terrain. We can see Lipa staza to the right, leading towards Paklenica. We continue straight along the trail for further 15 minutes of hiking, until we reach a pass between the conical peak of Segestin (1715 m.a.s.l.) and Brundo (1710 m.a.s.l.). On the other side of the pass, the trail gradually ascends to the base of the conical peak of Malovan (1709 m.a.s.l. ), and then descends across a small slope to the edge of the lake of Malovansko jezero (approx. 1600 m.a.s.l. ), which is in fact a larger pond of water, sometimes even running dry in summer. Until livestock farming disappeared from Velebit in the mid-20th century, this pond served as valuable watering place for cattle. We continue further, to a place where the trail passes to the littoral side of the mountain, offering a remarkable view of the sea and of the area of Mala Paklenica. The trail then gradually descends to Čičina dolina along the terrain with more pronounced karst characteristics, to a mountain pass above a slope covered in grass. This is where we come across a marked path leading to Ivine vodice to the right, and a marked path leading to Bunovac to the left. Further on, the route takes us south, gradually ascending along karst and grassland terrain to a pass between Babin vrh (1744 m.a.s.l.) and a nameless peak 1583 meters high. On this spot, we can see the steep slope of Sveto brdo. To the right, we can see a marked path leading to Vlaški grad. Very quickly after that, a steep ascent follows along grassland terrain to the cross on the top of Sveto brdo. From the peak of Sveto brdo, we descend to several available mountain shelters at the base of the peak, where overnight stay is possible. The available shelters are Vlaški grad, Ivine vodice, Zlatino sklonište at Libinje and a shelter at Dušice. All shelters offer only essential conditions for overnight stay, and they have no supplies. Wooow, so great to be here! Vlaski Grad is not there anymore and also no water. Ivine Vodice is lovely though, water a bit red.. I filtered it, just in case. This is a really nice trail. Well hikef and known, there's quite some other hikers out here in Paclenica. Thru-hikers might want to consider an alternate leaving Paklenica. The hike to Tuove Grede and from it to Gracac (next stages) is an exposed roadwalk and there's not much water out there.